Tomorrow is the next Auckland Transport board meeting. As usual I’ve been scouring through the papers to see what interesting items the reports contain. There’s a bumper crop of information in month, not all of which can fit in this post. Agreement Northern Corridor Improvements Project – This will most likely relate to the Rosedale busway station. Here is just some of the things that I found interesting. AT’s Business Technology and Travel Demand Management teams are running a ‘behaviour change’ trial on Onewa Rd to see if they can get more people on a bus or as part of a T3 car. This has started with trailer mounted LED signs showing travel times. It will be fascinating to see the outcome of the trial but it’s interesting to see that in the image they include, there are more cars in the T3 lane than the general traffic lane. I also wonder why the PT teams haven’t been running these kinds of trials for years. Over the last two board meetings, the Business Technology section of the report has been highlighting some of the interesting things AT have been doing with CCTV cameras. In May it was about counting pedestrians crossing the Customs/Quay intersection and cars stopped in the Quay St cycle lane. In July it was using CCTV to identify red light runners (which is separate from enforcement) and cars stopped on rail level crossings. Now they’re using it to identify speeding drivers, again just for analytical purposes. Speed is a significant factor in road safety. 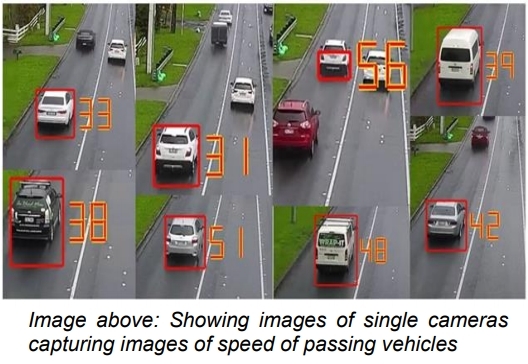 The CCTV Analytics team have confirmed that video analytics can detect the speed of a passing vehicle using a single camera, providing the necessary calibration and fine-tuning of the camera has been done. So far, two trials have been conducted, one at the Whangaparaoa Dynamic Lanes and another one on Fanshawe Street. The team is now working with the Travel Demand Management team to have this solution implemented permanently at a nominated site. The data gathered will be used for analytical purposes only at this stage. The only thing that’s not clear is how many of these examples are one off tech demo’s to show what’s possible and how many are permanent solutions that will be rolled out across the entire region to assist with decision making. Following on from the tech demo feel of the CCTV work, they’re also looking at other technology to incorporate. Auckland Transport want to pilot a ‘Digital Street’ to define, measure and assess the benefits that current and future technology solutions can deliver to the public, AT and other agencies. Smart Streets uses connected technology across the following segments; Energy, Transportation, Data, Infrastructure and Internet of Things (IoT). It is creating systems that can collect and share data that will deliver insights that enable and drive improved public safety, better traffic management and associated cost / efficiency savings. Project initiation is underway with a workshop scheduled to see what Smart City technology Auckland University is testing in its Innovation Lab. This visit plus other stakeholder workshops will allow us to build out the project scope to determine what Smart Street technology is ready for implementation on the chosen trial street and what is still in development / pending. Smart Assets could include; intersections, street lighting, CCTV, Wi-Fi, digital signage, help points, waste bins, toilets, bus stops, weather sensors, air monitoring devices, parking, and electric vehicle systems. It’s all very well that they’re looking at some of this stuff but it is concerning if it’s getting the focus when there are so many areas of technology where AT are sorely lacking, such as dreadful to navigate website, their often wildly inaccurate bus real time systems, their HOP processes and many other things. Customer Central have set up an explore sprint with the University of Auckland Centre for Innovation and Entrepreneurship to look at the problem of understanding ‘Why high-school students don’t cycle to school in areas where it is safe to do so’. The University ‘Solve It’ programme enables AT to provide this challenge to several teams of students at the end of August. An update on AT’s works around their mobile apps. The number of stops away, as opposed to the number of minutes away, was the best thing about the Track my Bus app and so with it now incorporated into the new app I find it actually usable. It’s also good to see them highlighting some of the things they’re working on for future improvements. The old AT Metro app has been removed from app stores, except for customers with old operating systems. The decommissioning of the Track my Bus app is planned for quarter four 2018. With the completion of the ‘HOP capacity upgrade’ in June, the HOP balance is the next feature planned for release in late September. The real-time feed is being enhanced from 30 to 9 second frequency to improve the accuracy of bus and train tracking. The first phase of an enhanced ‘disruption’ experience is in development – ‘train line status’. AT are trialing e-paper displays for information displays, such as at bus stops for real time info. They say there was strong customer feedback supporting them. As Ruchard Ashurst discovered a few days ago, Sydney is using these too. It seems AT are helping Kiwirail with getting funding, presumably for projects such as the third main an/or Pukekohe electrification. Also an update on services from Hamilton. Auckland Transport and KiwiRail continue to engage with the New Zealand Transport Agency regarding applications for funding via the Transitional Rail activity class. Auckland Transport is likely to be the conduit for funding of activities over the coming financial year whilst longer term arrangements are resolved. The details of this are being worked through. Staff continue to support the development of an ‘Interim Rail Service’ between Hamilton and Auckland. The Waikato Region has completed a Strategic Business Case, and is liaising with the New Zealand Transport Agency regarding completion of a detailed business case with which to secure capital and operational funding for the interim service. The future role of Auckland Transport in the delivery and operation of the service will be confirmed through the development of the detailed business case. Use of HOP ticketing is being considered. On the Hamilton services, a later note in the report says they’re targeting October-2019 for introduction. We’re concerned this will be a relatively poorly implemented trial, dumping passengers at Papakura resulting in such a long journey time it will be a failure and set back the idea of inter-regional trains for another decade or more. AT say the project is on track to start procurement in September and for physical works to start in January. AT received 665 responses on changing Freyberg Square into a pedestrian mall, something they should have been from the start.They say 95% of responses supported the change. It seems the 5% who didn’t support the change used the same old excuses, complaining it will hurt parking on High St. The City Centre Residents Association are pushing for a hearing on it and want a formal road stopping instead of just a pedestrian mall. Listed under the section on education activities is this piece. While there are relatively few local road deaths and serious injuries involving young people aged 5 to 16 years on bicycles, parents have a strong perception that it is too unsafe to allow their children to ride to and from school. In line with the Government Statement Policy, AT is exploring ways to encourage active cycling to and from school through training, education and safe infrastructure. A new cycle train has started for students who want to ride to Point Chevalier School. The cycle train initiative follows a similar set-up to the existing Walking School Bus programme, with AT’s Community Transport team supporting parent and teacher volunteers. 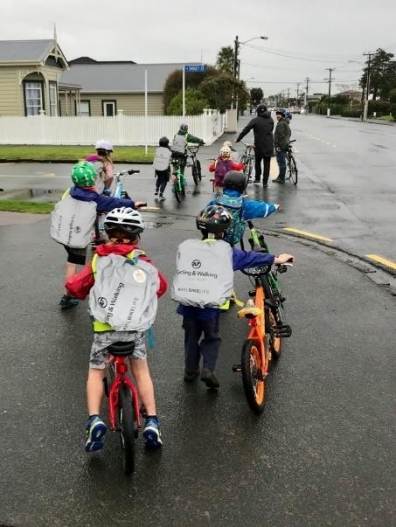 To improve safety on the cycle commute to and from school, AT delivered a student riding competency session, a safety workshop for volunteer cycle train parents and provided reflective backpack covers. Approximately twelve 5 – 9 year olds have joined the cycle train, and even on the coldest mornings, not one of the regular riders has stopped biking to school. The aim is to grow this programme with more students and families running cycle trains. The programme will be targeted to schools in areas where there is new or existing safe cycle facilities and a propensity to cycle. More kids riding bikes to school can only be a good thing. The NZTA and Police are looking at trialing point to point speed cameras in Auckland and AT have already suggested two “high-risk local road corridors” be included in the trial. You may recall we learnt back in May that years of inaction by AT and Police had meant red light camera’s weren’t being used. After that became public, the agencies finally sorted their differences and got them turned on. They say that within three weeks they had issued about 660 infringements, that’s about 31 a day. There are a lot of bus changes coming up, including some in the South to align with the changes to the rail timetables. One small comment does have me concerned though “preparation is underway for a value for money (VFM) review of New Network West“. We’ll have to wait to see what this is but it sounds suspiciously like AT are trying to cut bus services to West Auckland under the guise of saving money. Given current government policy around PT, they’d be pilloried if they tried this. Each report AT detail the major incidents that effect train performance. This one sounds quite concerning and combined with the derailment just over a month earlier, likely left us a few trains down, which would have impacted crowding levels. Good thing we’re getting another batch of trains to help provide more capacity. An AT Metro service struck a freight locomotive coupler, on the approach to Meadowbank Station on 28 June. The collision caused significant damage to the unit (AM334). The coupler unit joins freight wagons together, or to the locomotive, and an investigation is still ongoing into the circumstances leading up to the event, and how this piece of equipment came to be on the rail network. It appears ferry timetables could be lengthened and possibly frequencies changed. Inner Harbour services to Bayswater and Birkenhead continue to be affected by journey time issues and berth congestion, and a proposal is being considered with Fullers to review timetabled journey times to more accurately reflect actual journey times, that may include a review of the frequency for the Birkenhead service. Just look at the diagram – the legal road is through the public space and the current car access is mostly through council reserve. And we don’t trust future AT not to come back in 10 (or 20) years and open it to cars again. Looking for a real long term solution, not a repeat of the mess that is St Patrick’s square. Interesting point. The square at Pt Chevalier is still a legal road. While it’s possibly in the public interest to keep re-opening it as a transport area a possibility (in some wild scheme of completely redesigning the transport in the area), are the authorities so inflexible that the square could not have become Council-controlled land, and in the unlikely scenario that it should revert to being a road again, this is enabled in the future? The current situation, where a square – with its Council-sphere characteristics and place needs – is controlled by AT, is not ideal. Equipment there that neither organisation seems to keep on their maintenance list, for example. And more steps involved in getting event sign-off. What strange situation leads to AT (or its predecessor) retaining control of both the new road location, and the old road location? Does it not show some bedded-in hierarchy given to transport over placemaking? Well it’s just ‘easier’ to make it a pedestrian mall, but it doesn’t solve any of the issues (as noted, maintenance, the fact that the road actually crosses the water feature, yadda yadda – AT will still decide when to allow vehicles in to what should be an Council controlled public space. I cannot help but wonder if AT have just given up on the issues with the ferries, largely down to a lack of wharf space at downtown Auckland, and will cut services to Birkenhead. Lengthening journey times will add another disincentive. If they physically looked at it, (crazy I know), tying up ferries out of service at peak times takes up valuable birthing space and this coupled with a severe lack of investment in infrastructure since AT’s formation is more or less taking ferries off the PT options list. Either spend the money and grow the business or stop wasting subsidies on it and divert that funding elsewhere! Fuller is having way too much influence and monopoly at the cost of everyone else. The AT ferry strategy department needs a shake up and shows some leadership. 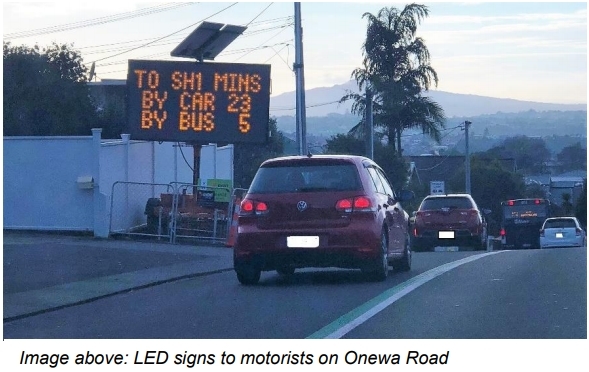 Onewa Road Sign — I like the idea of using cheap interventions to nudge people towards behaviour change, although looking at the photo I do wonder how much of the footpath is blocked by the trailer on which the sign is mounted? Can anyone who travels through the area put my mind at ease? West Network review — why so sceptical? “Value for money” is not equivalent to cutting services, but rather trying to ensure the available resources are used most effectively. I’m of the mind that all PT networks should be reviewed/tweaked regularly, e.g. annually, so as to progressively ratchet up patronage. I can only hope”saving money” does not equal further erosion of driver’s wages and conditions, the usual go to “saving”! In my experience (which may not be relevant here depending on what AT are planning) the phrase “value for money” is usually used to justify reallocating PT service rather than reducing it. So I’d expect to see a one-for-one $$$ swap with low productivity services ditched in favour of more productive services. I could be wrong, however. While I’m generally in favour of regular network reviews, I do wonder if this one comes a bit early? For the reason that the CRL will really transform the demand for many western services. And that’s before talking about NW-RTN etc. Given how much is happening perhaps this is a case where you’d want to wait before making a more substantive change? The review could include this? I’m not sure where this all got to. There might also be further marginal services at the edges of the network? Auckland Transport and its partnering agencies need to look at how to get the best response from infrastructure investment. If they used that sort of paradigm thinking then challenges like the housing crisis and chronically congested roads could be solved. You can’t tell from the picture of the sign how much footpath is left. If you can’t get past, it would 150m back to the lights, (or two sliplanes plus lights) then along 650m to the next lights before you can swap back. Looking at the location, though, why didn’t they ask the neighbours for a carpark to put the sign in? Apparently that property was sold last year – no idea what it’s used for now; is it in limbo until developed? In any case, did AT consider approaching the owner, or is pedestrian amenity cheap to give up? I walk past this sign twice/day/ It takes up half the footpath (pedestrian only – the shared path is the southern side of Onewa). Its actually quite clever as the other side of the sign warns westbound motorists of restricted access to Highbury Town Centre while it is being upgraded. I’m looking forward to seeing the results of the “explore sprint” (whatever that means) into ‘Why high-school students don’t cycle to school in areas where it is safe to do so’. First of all, love to see where they’ve found in Auckland that is a safe place to cycle to school door to door. Safer than others, sure. But most of our built environment is set up for driver convenience, not cycling safety, and driver behaviour – while generally becoming more accommodating of people cycling – includes adopting speeds that are too high, redlight running, not stopping at crossings, and assuming precedence over vulnerable users at intersections. Secondly, the coolness / uncoolness of cycling will be fascinating to unpack. The Pt Chevalier Cycle Train has kids who had been quickly taking their fluoro vests off and hiding them at school out of shame. Now, thanks to the cycle train, they wear their fluoro vests all day as a proud mark of identity. Bike helmets have had a huge impact on reducing school cycle rates down here in Christchurch. Full bike parks have been replaced by full scooter parks. What is the difference between bicycles and scooters? One is safely allowed to use protected footpaths without helmets and the other has to use unsafe roads with helmets…. And another difference is that the small wheels of scooters make them far less safe – you’re much more likely to go flying after hitting a bump. So regressive laws around helmets and unsafe cycling infrastructure mean our kids are having to adopt a less safe method of travel. Good oh. I note that helmet laws and riding on footpath laws were mentioned in Julie-Ann Genter’s briefing paper to Cabinet as things she’s intending to change. Wonderful that someone who actually cycles and understands these things is now in a position to make progress. On signs, e ink seems like a good idea because it uses such little energy. They only consume power to update the screen, rather than keep the display going. So in theory it should be cheap and easy to install solar powered 3G signs at just about every bus stop. Having to connect power and data to a sign could easily add thousands to the cost of installing one. These e ink thinks could be simply screwed to a lamp post. However, I think it is time they changed the way the data is displayed. Now we have the new network there aren’t umpteen million diffierent bus routes at every stop. Even the busiest has only a two or three. Have you ever stood at the stop on K Road as three or four pages of Inner LInk and City Link scrolls past, telling you the timetable an hour and a half away three lines at a time? Crazy, you only want to know when the next one is and maybe one a few after that to see the pattern. Rather than each individual bus service having it’s own line on the display, each bus *route* should have a line on the display. E.g. Totally support the RT signage showing the next 2-3 services at most. Indeed, the same silly situation occurs on the northern busway. I think you get 10 pages of NEX and 881 services. If you think that is stupid, go to the AT website and watch the Real Time Board display 4 lines at a time in a similar way. Because, yeah, space on a web site is totally limited to 4 lines. Most displays on bus stops don’t have enough columns to display multiple departure times on one line though. At best you can display a destination on the first line, a few departure times on the second line, and then a destination + departure time on the third line. A minimal change which would already improve things is to have at most 3 instances of any single route in that list. Ya lol website same 4 line issue. Don’t mention the display at the major interchange Victoria Park stop you can’t read at the important main waiting end or even part way along as the roof hides it. I’m a massive fan of replacing all current display tech with either transflective (think digital watch tech, but in colour) or e-ink displays. I’m excited about ACeP or Triton 2 e-ink displays for colour signage, but shudder at the cost. Also ACeP isn’t available yet. The information needs to be more user friendly. The map needs to show the current routes, nearby routes and point of interests, as well as connection to the wider network, in a fast and simple to understand manner. How much ‘trialling’ of speed cameras do we need to see? From a webinar I watched last week: “NYC installed 140 cameras in school zones to deter speeding and they did deter speeding. In the first 2 years of the programme the number of violations decreased by 63%, traffic fatalities down by 55%… they’re giving out fewer violations…. This is not about more tickets and fines, this is about encouraging good behaviour and deterring poor behaviour.” Can someone fill me in on why we still need trialling in Auckland as if there’s something unique to Auckland we need to uncover? The “unique” aspect is that you’re dealing with Kiwis. Our culture hasn’t caught up with the “modern world” – In many respects we’re still stuck in an 80’s mindset. As much as I love the 80’s, this holds us back. We’re always saying stupid things like “we’re a small country but we punch above our weight”. That mentality holds us back. We’re not that small by European standards, nor do we do that well outside of sport. Our culture needs to go from “that won’t work here” (why won’t it work?) to one of “what lessons can we apply from overseas”. Sorry if I’m “mansplaining” but this is something that aggravates me immensely. Why don’t we learn!? The was a trial 10 years ago to test the safety effect of red light running cameras. Proved effective. Nothing further done until now. They are now trialing a NEW type of camera. It isn’t a trial of the use of the cameras, but the actual camera itself. I still don’t understand how they haven’t just put them in at pretty much every intersection based on how effective they are at reducing dangerous driving behaviour. They should pay for themselves quite quickly, including any admin costs. Seems pretty stupid. How come everyone is walking on the ‘cycle’ ‘train’? And the one that is riding is doing so illegally on the footpath. Do AT think the road is not safe to cycle on? Yes, of course it’s not safe to ride on that road. I know multiple friends who have broken limbs and been knocked off bikes. I had several incidents in a row myself recently, and was also shouted and sworn at for riding on the footpath after a bad situation that made me move there. AT know it’s not safe, that’s why they’re designing a cycleway. They have also put together a good business case for making improvements throughout Auckland. But they are held up by a culture of cycling-hating in some of the top levels of AT. The cycling budget only included modest changes – none north of Takapuna as one example – yet the problem people have slashed that in half. At some point, legal action will need to be taken. I hope ACC get in on the act, because not making vulnerable road users safe is causing deaths – both in the preventable deaths that Lucy Saunders spoke at length about in her Healthy Streets talk, and in traffic violence. Shane, get rid of the cycling-haters, please. In the picture they are crossing a road. It is very sensible for Children that small to hop off their bikes and have to stop and look to ensure it is safe. Yes the Adults are also making sure but it will install the idea for the children to be careful around intersections. As for illegally riding on a footpath it depends on the wheel size if the bikes can legally ride on a footpath. I can’t remember the actual limit to sizes but the NZTA website will likely have the details. Again you don’t want tiny children to be forced into an environment that is unsafe for them which being on the roadway would be at that stage of their development. The allowed wheel size is smaller than all but the smallest bicycle wheels for toddlers. Any kid riding to school will have larger wheels. – The cyclists are riding along a street where cars have priority over traffic on side streets. Cyclists and pedestrians don’t have the same priority, they must give way to turning traffic and traffic on the side street. – The line is flush with the roadway for cars. Further signalling to drivers that you have to stop for car traffic but not for foot traffic. Now, how do you check for all that traffic? You possibly have to give way to cars coming from your left, from behind you and from in front of you. This is quite a challenge even for adults. I think an interim train service from Hamilton that terminates at Papakura would be OK as long as there is a clear plan for improvement, say extending it to Otahuhu in 2021 once the third main is completed along with the new airport transfer station at Puhinui. If the interim train service is going to terminate at Papakura, it will fail and will added to the anti rail lobby rhetoric in Hamilton, ‘we told you so’ – there isn’t the demand for Hamilton/Auckland/Hamilton train services. Folks in Hamilton want train services to Britomart if using EDMU train services or to The Stand if using diesel electric engine and carriages. Whilst I totally support regular passenger train services between Hamilton and Auckland, I don’t want to travel to Papakura to change trains for onward to and from Britomart, being the general consensus in Hamilton. I would prefer to travel on InterCity’s 7.00am express service from Hamilton to Manaku City and Skycity or InterCity 8.30am and 10.30am express Gold services to SkyCity via Auckland Airport. The one way fare on InterCity Gold services from between Hamilton and City is $20.00 for a standard seat and $25.00 for a gold seat and get free wifi plus I can cheaper travel if using InterCity Flexipass if travelling on a daily basis. The one draw using InterCity, is Auckland bad morning and late afternoon/early evening evening traffic hold ups on the Southern Motorway. I’ve been on those Intercity buses. They are cramped, uncomfortable, induce car sickness, and get stuck in traffic on the Southern Motorway and end up taking 2 1/2 hours. Also it’s $20 PLUS a $4 “booking fee” one way which is my opinion is ridiculous, $44 HLZ-AKL return, I don’t think so, it costs me less to drive. The last time I used one I gave up at Manukau and caught a train into town, so much better. It’s obvious most people using that bus only do so because they have no alternative, which is the tell tale sign of a unattractive PT service. The train can’t come soon enough, transferring at Papakura with a 10 minute service frequency is easy and convenient. Yes, and Intercity in Auckland has no nappy changing facilities, no drinking water facilities, the toilets are surrounded by foul unclean walls, corners, doors, even hand driers that are dirty, and there are no unisex toilets so what do fathers travelling with daughters do? From what I’ve heard of elsewhere, nappy-changing often has to occur in the freezing wind outside. The Sky City bus station is embarassingly bad and then you face the excruciating crawl along Hobson St and down the Southern Motorway, just a terrible experience. It would be more tolerable if the cost of the service was low but it isn’t so it’s the worst of both worlds, expensive and low quality. They won’t even give you correct information about bus arrival times, either, telling me that the bus was on time when it was already running quite late.And don’t get me started on the lack of information there about how to connect with Auckland’s PT once you’ve arrived… Mind you, I do like the actual buses and seeing things from that higher level. This again demonstrated the people who design this are not regular PT users. Perhaps AT need to study oversea cities with mature efficient PT system to create a unified PT usability framework. Zippo – Intercity Auckland/Airport/Hamilton express Gold service travels via the Waterview tunnel bypassing most of the shambolic traffic congestion on the Southern Motorway. Yes I do agree things do slow down when State Highway 20 merges with State Highway 1 at Manukau. I don’t think you can blame InterCity for Auckland shambolic motorway. Judging by your comment, you drive, so you are contributing to Auckland’s motorway melt down. Heidi – I do agree with your about the Skycity coach terminal. It looks bad as the major coach gateway for Auckland. It just shows how little that Auckland Council is motivated in do anything about and looking for a alternative place. With regards to the toilet facilities at the Skycity Coach terminal, Skycity it is responsible for the maintenance and cleaning for the toilets and and departure area as part of Skycity lease to InterCity Group Ltd.
As you know, Skycity wants InterCity gone, so Skycity can use the area and hence that lack of interest by Skycity to keep the coach terminal up to scratch. Maybe, you and the of the team of Greater Auckland needs to take up the state of Skycity Coach Terminal with Skycity, Auckland Council and Auckland Transport to why Auckland’s major inter-regional and long distance coach arrival/departure gateway is as you describe instead of moaning about it. Good idea, Kris. As with many things, it will indeed have to be a campaign undertaken by concerned citizens using the media cleverly. You see, we’ve given Council and Sky City a chance to do something about it; we’ve done more than moan. Not only Council have been approached, but politicians of almost all parties. Council, who should be concerned about the amenity for all travellers, including children and parents, and about the effect on tourism, palm it off as simply a health and safety concern. And somehow now that Sky City are finally cleaning the toilets, floors and basins more frequently, but leaving everything else dirty, and certainly not providing the basics for travelling parents, Council think that’s all they have to do. Too hard basket and all that. Since you’re concerned about the issue, would you like to kick this campaign off? I can’t see intercity buses still running to Auckland in 10 years time, I imagine they will terminate at Hamilton and allow a connection to regional trains once they are running to Britomart. We do need decent stops in the interim, but I can’t see there being a big investment in a terminal. Heidi – If Auckland, being NZ’s largest city and the ‘gateway’ to NZ wants to greet international and out of town visitors whether they arrive by bus, train or plane with its run down unloved coach, train and airport terminals, to me its Auckland problem. Since I don’t live in Auckland, why should I start a kick campaign when such a campaign should be started by people living in Auckland using creative media by organisations like Greater Auckland, Gen Zero, etc. Its Auckland that benefits from domestic and international tourism, so Auckland should be doing something about make Auckland more welcoming instead of being ruled by NIMBY dis-functionalism and tourism complacency. jezza – With regards to your comment – “I can’t see intercity buses still running to Auckland in 10 years time, I imagine they will terminate at Hamilton and allow a connection to regional trains once they are running to Britomart.” Okay, what about InterCity services north of Auckland to Whangarei, Paihia, Kerikeri and Kaitaia will they depart and terminate in Hamilton and then the passengers travel back to Auckland by train? What about Great Sights sightseeing tours and scenic coach service between Auckland and Paihia and Auckland, Waitomo Caves, Hobbiton and Rotorua, will they depart from Hamilton and passengers on InterCity overnight and sleeper services depart from Hamilton will travel to/from Hamilton and Auckland by train? All InterCity and Great Sights coaches that overnight in Auckland are at Ritchies Auckland depots mainly at West Auckland. Ritchies does not have any depot facilities in Hamilton. The 3 or 4 InterCity coaches that overnight in Hamilton are based at Go Bus Hamilton city deport or at Go BusTe Rapa depot. I don’t see InterCity Group’s major shareholder Ritchies building a new depot in Hamilton for their Auckland based InterCity and Great Sights buses, coaches and scenic coaches. Sorry, I meant to say buses from the south. Buses from the north would still run to the CBD as they have good run on the busway, although I guess that might change if it is converted to light rail at some point. It also reminds me Mana bus was banned from using the convenient Quay street location. After the relocation the business just goes downhill and shutdown. The consumer lost another choice and goes back to a low quality monopoly. Ultimately should the council be responsible for this? It appears they are helping to kill of market competitions. Good for you but I’m not paying $54 for a bus that takes over 2 hours (not infrequently 2.5+ hours) each way when I can consistently drive it in less than 1.5 hours, even with the roadworks around Te Kauwhata. Any time saving gained by using the Waterview tunnel is thrown away by the interminable trundling around the airport precinct, not to mention the inevitable crawl between Papakura and Manukau. Judging by the sea of empty seats on those buses when I have used them, I’m not alone in my low opinion of this service. Zippo – it show that you are a car fixated person who likes to join the rest of the other car fixated people living in Auckland or Hamilton in creating Auckland shambolic traffic congestion. You have no idea what the passenger loadings are, as you are in your car. Most of the passengers between ex Hamilton or ex Auckland get off and on at the airport, There is usually only small amount of passengers will continue from the airport to Skycity and from Skycity to the airport. The delays of these services is not trundling around Auckland airport as you claim nor from Hamilton to Papakura but the traffic congestion of the Southern Motorway between Papakura and Manukau City which is an Auckland problem not by the bus operator. I think a service that can get to Otahuhu would have reasonable appeal. From there it is possible catch two lines to Britomart so the transfer time will be quick. I don’t think going to The Strand would be any quicker given the walk times. I agree Papakura is not ideal, but if it was clear that it was only for 2 – 3 years and construction was already happening on the third main people would understand. The anti-rail lobby probably voted for National last time so are largely irrelevant, they are not going to change the outcome of the next election. The traffic drawback you mention is quite a significant one, I would add to that being dropped at a windswept location on Hobson St.
Jezza – Hamilton are strong National seats, so anti-rail and pro roading is strong, hence re-establishing commuter services between Hamilton and Auckland has to be done right from the start, no temporary solutions. At this stage, the proposed commuter train between Hamilton and Auckland has to be one fare, if it means train transfers at either Papakura or Otahuhu. The latest I have read, since funding for the Hamilton to Auckland train services is predominately Waikato Regional Council and NZTA. Auckland Transport wants passengers to pay a separate on the Auckland trains. What Hamilton folks want is to pay one fare from Hamilton to Britomart. To-date, there has been little discussion on whether passenger will pay for one fare or two fares. If passengers have to pay for 2 fares, there will not be the passenger numbers to make the services viable. Agree – it needs to be one ticket to Britomart at least. This shouldn’t be an insurmountable hurdle, it just requires the parties to get round the table and agree on how revenue is shared. I don’t think Hamilton having strong National seats will have any impact. We haven’t used seats to determine the overall makeup of parliament (with a few small exceptions) for 25 years. Also as I mentioned in my previous comment, it doesn’t really matter if all National voters from 2017 turn up and vote National again at the next election, they will still be in opposition. Hopefully it will be HOP the whole way, problem solved. Now just get the Hamilton buses to use HOP instead of reinventing the wheel and we might be getting somewhere sensible for once. It makes sense using this system instead of separate systems like AT Hop and Snapper. HOP exists now, it works fine in Auckland with most of the bugs sorted out. This new system is years away at best and the implementation will be led by the Greater Wellington Regional Council which must be a real concern. The best thing that could happen is the new government informs the GWRC to forget about this new system and use HOP. I agree, They need a long term plan for the Auckland-Hamilton rail corridor. Initially, sure, use the SA/SD carriages and some old diesel clunker locos terminating at Papakura but emphasise that every aspect of the journey will be progressively improved in the years to come. New rolling stock, new stations, more frequent services etc etc will have the same effect as the upgrades in Auckland did. And, of course, it’s vital to get the average speed up to something competitive with the expressway and that means fixing the Whangamarino swamp section, which must have a high bcr justconsidering the number of freight trains using the line. They need a long term plan for the Hamilton Auckland road corridor and one part of that plan should be a couple of points where it is tolled, so that the further you drive the more you pay. The toll could then be applied to assist the implementation of the high cost rail solution that would run at reasonable frequencies. It’s already tolled when people pay their fuel tax. Intercity rail will benefit generations to come, I don’t think it is fair to lump the costs on today’s users of the Waikato Expressway. Jezza, why is it not fair for today’s users to pay for the Expressway? Parts of it have just been built and it seems reasonable for those who are benefiting today, tomorrow and years to come to pay for it. The evidence is that the fuel tax is not meeting the roading needs of the country. I would sooner have our taxes applied to deliver a robust, fully functioning hospital system and let those who choose to drive pay for it. The other reality is that the country’s emissions from transport use are ballooning. The carrot approach has not worked and so it seems it is time for the stick. The advantage of the stick approach is that it generates revenue to offer alternative means of transport. Your previous comment mentioned tolling the current users of Waikato Expressway to pay for a future regional rail system. That is very different to tolling the current users of the Expressway to pay for the Expressway. You seem to have forgotten the purpose of your toll proposal. I agree with you regarding emissions costs, however this applies to every road not just the Waikato Expressway. Properly taxing emissions through fuel a much better solution to this than an arbitrary toll on one particular road. Jezza, what planet? “It’s already tolled when people pay their fuel tax.” Tell me with a straight face that they are paying for all the costs of their travel, leaving no externalities in the way of climate change, health costs, social costs or leaving high levels of infrastructure that future generations won’t be able to maintain… and I’ll call you a fibber. Today’s road users are putting mighty high costs onto both present and future generations, and the fuel tax is capturing a tiny fraction of that. We need to prioritise the infrastructure that is most needed. This should only be infrastructure that contributes to lowering our vkt, our climate emissions and our transport network’s burden on the health and welfare systems. And then we need to pay for it. Any funding mechanism that does not deter people from making poor transport decisions is a lost opportunity. Heidi – did you actually read my comments!!? As I said I completely agree with you both – we need to accurately account for all of the things you just mentioned, that we currently fail to. I don’t see how a random toll on one road that charges someone the same amount for driving a Suzuki Swift or a 6 litre V8. If you want to account for those factors accurately and fairly then add it to the fuel tax. The Expressway will potentially hugely increase greenhouse emissions because it makes parts of Auckland more readily accessible from towns along the way. The small amount of fuel tax won’t do anything to ameliorate this. Very soon there will be a very good way to travel between Auckland and Hamilton and that will be high speed rail. That option won’t be available to other NZers and so that is why I propose a road tax for this route alone. It seems a fair trade off as we move towards carbon zero; you pay to use the carbon unfriendly option (the road) or you take the other option. If there are other parts of the country that have alternative low carbon options then a toll may be appropriate there. I have written a post for this blog that suggests a toll to fund light rail from the North Shore. I see your point, however I’m not sure charging nearby roads on a case-by-case basis is really the way to go. If we are concerned about equality between regions then it might be best to say spend the extra fuel tax revenue gathered in Taranaki on road safety improvements or in Canterbury on cycling for example. I don’t see why emissions on the Waikato Expressway are any different to those on other roads in the country. Irrespective of the choices available we need to distinctivise emissions across the country. People have recently argued quite strongly that until there is a viable PT option, they shouldn’t be charged a fuel tax or any pricing. Maybe this is a perfect poster opportunity to do just that, including pricing that fully captures all present and future costs. Zippo – I agree with you. I believe future rolling stock should be EDMU’s between Auckland, Hamilton and Tauranga similar what GWRC wants to do, between Wellington, Palmerston North, Featherston and Masterton, using electric traction between Auckland and Papakura or Papatoetoe and diesel to Hamilton and Tauranga. Using either EDMU or EBMU operation would allow for CRL operation. I still think electrifying and upgrading the track with double tracks between Papakura/Papatoetoe to Hamilton and Tauranga for EBMU operation. I agree regarding EDMUs, however I imagine they would terminate at Britomart for a couple of reasons. All available slots in the CRL will likely be needed for suburban services in the future. Also regional trains will likely have slower dwell times so would not be suitable for the high frequency running in the CRL. Off the shelf DMUs would be much cheaper and easily obtained. Just change at Otahuhu. Otahuhu is fine as an interim solution, but if we are serious about these trains carrying large passenger volumes in the future they will need to offer the quickest possible service between Hamilton and Britomart. This doesn’t involve a transfer at Otahuhu. A fleet of modern DMUs would be useful elsewhere even if they were displaced in Auckland. For example on the Wairarapa line or Christchurch. As an aside – are DMUs really ever ‘off the shelf’? With the different track guages, loading guages, platform heights, platform gaps and track geometry, I would have thought most DMUs or EMUs would be at least partially bespoke. For example, I can’t imagine Sydney’s fleet of 1500V double deckers would have been ‘off the shelf’, however they have managed to afford them no trouble. Hopefully rail in NZ can move away from the scrimp and save mentality and actually get rolling stock that gives a high quality service even if it costs more. In other good news, the Harbour Bridge is a very safe bridge for pedestrians and cyclists, with no recorded deaths and serious injuries. Yay. Whoever wrote that paragraph should actually try and get out on a bicycle. Deaths for cyclists has risen by 100% between 2012 and 2017, and serious injuries for cyclists has risen by 112% in the same time period. If not many children aged 5 to 16 are reflected in these statistics, it’s not because there’s some parallel safe universe for them: they simply aren’t cycling! Just as the Household Travel Survey shows. And that’s because the parents are right in not wanting them to be seriously injured on killed in the unsafe traffic environment we’ve been dealt. This is bang on – and the Healthy Streets approach (Lucy Saunders’ stuff) puts it so well: our environment isn’t letting us get the necessaries of life. But the footpath point is a good one. All good for littlies like these ones (actually it is legal to footpath ride if your wheels are small), but why not create a sort of biking T2 lane for their school bike bus journey?! It’s easier to impinge on parking when it’s “for the children”. Trial that! Also, fun fact – “bike train” is another word for using bikes to solve the first-mile-last-mile problem of accessing trains! Pt Chev’s Walking School Bus was one of the first, and was entirely initiated by parents. AT didn’t even exist at the time. Pt Chev’s Cycle Train was also entirely initiated by parents. It feels fuller are trying to cut service by using ‘congestion’ as an excuse. That is a big problem for the monopoly of fullers and lack of AT intervention. I hope they are not trying to cut service to save money. They likely need to apply some replaceable anti graffiti and anti scratch protective firm and locate those in secured areas. Sounds good, may be have a CCTV feed to send anti-social behavior to police and security companies. Hi, I helped setup and now run the Pt Chev School Cycle Train. We are doing our best to keep the kids as safe as possible – through route design, training, and equipment. We are welcome to feedback on how to do this better, and there are clearly some very switched on people on this thread… If anyone would like to ride with us one morning and give feedback on what we can do better to keep our kids safe, please reply to this to let me know. Thanks! Good idea, Matt. Should people contact you through Pt Chevalier School? And thanks for being so proactive; I passed an old friend on Premier Ave this afternoon, and she said how cute the kids were on your train. Plus she said that she and her friends talked and talked about setting up a cycle train ten years ago, but they never found the energy. I can be reached at mattfordham[at]mac[dot]com. Thanks Heidi. One thing that continues to puzzle me is the size of AT’s closed session agenda. Admittedly things at the other end of the island are on a different scale, but in Wellington such public-excluded items are rare on both WCC and GWRC agendas. I wonder why the difference? Probably because nothing much is happening in Wellington in terms of infrastructure development.